Supporting the choices mothers have made, while educating and empowering them in order to support these choices. Women, m/others, musicians, authors, comics, dancers, filmmakers, designers, craftswomen, educators, merchants, and community leaders coming together in a collaborative effort to highlight the challenges of motherhood in an ever-evolving personal, social, cultural, sexual, and political landscape. Recognizes and honors the growing awareness of moms; their personal stories, their power as both consumers and constituents, and their continuing need and desire to creatively express themselves while building Mom-based businesses that sustain them. Connecting Women, Mothers and Families through Music, Art, Activism and Education for Cultural, Economic & Social awareness. MOMS ROCK! Mamapalooza, Inc. has produced hundreds of community arts and culture experiences for women and families, inventing and identifying mom-branded entertainment since 2002. Led by Joy Rose, national radio’s Media Mom, award-winning singer, writer and motivational speaker, Mamapalooza brings together musicians, artists, dancers, filmmakers, writers, business owners, educators, and moms of all kinds to celebrate motherhood and to highlight the challenges caregivers face in an ever-evolving personal, social, cultural, sexual, and political landscape. A mom-owned and -operated multimedia organization, Mamapalooza was founded by Joy Rose and nurtured along with a core group of dedicated professionals, local event coordinators, community partners, special advisory board and volunteers who have successfully pioneered this new culture of mom-branded performance, business, and activism. Events, media, workshops, festivals, publications, CDs, membership, and online support connect and entertain through grass-roots programs that empower and support mothers internationally. In addition, Mamapalooza and Joy work in partnership with the Motherhood Foundation, Inc. towards the formation of a Museum Of Motherhood; and with Alignment Media to launch the Mothers Day Today Tour. 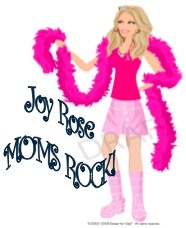 Joy created the saying “Moms Rock” in 1997 with her band Housewives On Prozac, (The first “Mom Rock” band ) and partnered with Ephemera, Inc. to create buttons, stickers, magnets, tee shirts, and buzz. Mamapalooza was named as ‘Best In Girl Power Events’ in 2009, by Westchester Magazine and is a member of the International Mothers Network as well as a holder of trademarks that have included: Papapalooza, Media Mom, MommyGirl GoGo, and Museum Of Motherhood, as well as websites: MamaZtv.com, Media Mom.com, and Mamapalooza.com. Mothers Day Party: A new city-to-city tour that connects savvy moms through stylized, celebrity driven events that pamper, inspire, and inform and networking and focus groups. Every program that Mamapalooza produces puts women, mothers, and families at the center of activities. The purpose is to increase opportunities for women in business, celebrate mother art and educate the public about the social issues facing families.. Supported by our ongoing blog, videos, and web presence via Facebook,YouTube, MySpace, Twitter, Flickr, Blogs, Mom-centric online communities and MamaZtv.com, we generate relevant content for women to learn from, explore, and enjoy. Building on successful community outreach, past positive results, and relationships with key influencers, we are highlighting the voices of mothers, driving membership, building brand awareness, and gearing up for future large-scale events in 2010 and beyond. Mamapalooza is the nation premier mama-multimedia organization that engages more than 75,000 families at events each year. MOMS ROCK!